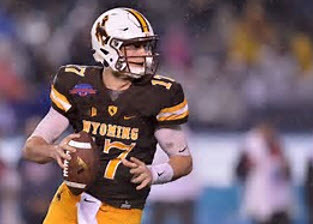 With competition for the top quarterback in the 2018 class like Sam Darnold of USC and Josh Rosen of UCLA, you would think that coming from Wyoming would be a liability. Still, Allen plays in the same offensive system under Craig Bohl that saw Carson Wentz become the second overall pick in the 2016 draft. While Allen has physical gifts that few possess, he is mentally behind where Wentz was entering his second year as a starter. With two years of eligibility left, Allen has ample time to fulfill the massive amount of raw potential he has, but with a strong Junior campaign, he could be a lock to be picked in the top 10 next April. When discussing Allen's strengths, it would be foolish to start anywhere else but his arm. Few players at any level of football have the ability to drive the ball down the field like he does. Even on the run, off one foot he makes throws down the field that are unbelievable. His motion is mostly compact and very quick. He doesn't alter his release point and occasionally shows good touch in appropriate situations. His size is also impressive, and while he doesn't have the bulk of someone like Cam Newton, he displays similar power that makes it incredibly difficult for his opponents to get him to the ground. Part of that could be the quality of competition he plays in the Mountain West Conference, but at only 235 pounds, he has plenty of room to add bulk to his frame. Allen also displays very good athleticism for a guy that is over 6'5". He is elusive in the open field, and his nimble feet make it that much more difficult for pass rushers to get him to the ground in the pocket. I am impressed with his ability to make plays when the protection collapses, but that also brings me to one of his biggest weaknesses. While Allen shows the ability to elude the pass rush and make plays with his feet, he routinely drops his eyes when rushed and the only way he makes a play with his arm is if a receiver flashes into his vision. After defeating San Diego State in the regular season, the Aztecs blitzed Allen consistently in the Conference Championship game. The result was a completion percentage that fell below 50% for only the third time of the season, and a loss. With the offense losing quite a few pieces, including running back Brian Hill, teams are likely to focus their efforts on stopping Allen in 2017. He is going to see a lot of blitzes, and he needs to demonstrate the ability to maneuver in the pocket while keeping his eyes downfield. Another area I want to see him improve as a Junior is with his decisions. This kid plays with a die-hard mentality, and it results in some throws being made that should never leave his hand. We have seen it with a number of quarterbacks at the NFL-level. When you have a strong arm, you feel like you can make any throw in the heat of the moment. The truth is, the passes across the field are rarely going to find a receiver in the NFL. He has to play smart and realize when taking a sack or throwing it out of bounds is the best option. That kind of competitive nature may result in a "wow" play once in a while, but at the speed NFL defenders play at, it is more often going to end in disaster. He needs to take the same mentality once disaster has struck. He chases down defenders after a turnover has been committed as if to make up for the poor decision he made but the reality is, a turnover isn't worth a season. 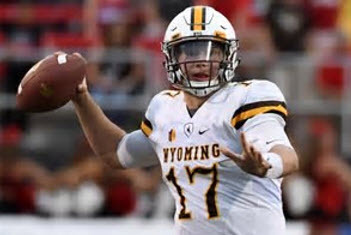 I have often said that there aren't enough proven quarterbacks in the NFL to provide one per team, so the idea that a backup can come in and give a team a realistic chance at salvaging a season once the starter has gotten hurt is meager. There is no sense putting the season in jeopardy to make a single tackle. Overall, Allen has experience under center and reads the entire field which are both positives for a future in the NFL. He also shows the kind of passion that teams want to see from a player who will still have plenty of room for refinement whenever he chooses to enter the draft. There are certainly leadership characteristics to support him being able to command a huddle and no signs of him having any personality flaws or problems away from the field. I wish he had more to do with the calls being made pre-snap, but he was only a first-year starter. He will likely be in the first-round conversation no matter what the results of his Junior year because of his raw talent but if he indeed takes a step forward mentally, he will be in the conversation for the first overall selection.